Showit with the Advanced Blog provides hosting of your Showit Site with a Managed WordPress blog. 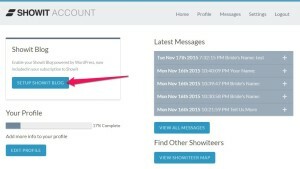 Once you have subscribed, please request your blog migration or setup in your Showit Account. The reason for this level of subscription is for someone who needs more control over their blog and customization to install custom plugins. The blog URL can be on your domain alongside pages created by Showit like yoursite.com/blog or it can be hosted at a subdomain like blog.yoursite.com or another domain like yoursiteblog.com. This hosting includes access to upload files via FTP and access the database used for WordPress. You can upload your own WordPress plugins but there are a few plugins that are prohibited because they interfere with our managed WordPress setup or duplicate functionality already provided. Showit will install your new or migrated WordPress blog at the root domain (yourdomain.com) you are using for your Showit Site. We are also able to install your new showit blog at a different domain. Why is the Showit blog hosting better then my current host? We are happy to provide FTP access by request. Our managed WordPress servers do not have a standard cpanel access. We’re happy to help address any settings concerns via support. We are happy to assist migrating All files that were uploaded via the WordPress media manager and all posts should copy over to our server without issue. If files were manually FTP’d to your server they may not automatically migrate to the Showit server and you would need to save those files to to your local computer until you can FTP them to the new server at a later time. We always suggest saving a backup of all server files until you have confirmed that all files have copied over to the Showit server. To request a blog setup, login to your Showit Account profile and request a blog setup. Most plugins will work. There are a few plugins that will be disabled automatically if they duplicate functionality or if they will slow down your site loading. The following is not an exhaustive list of disallowed plugins. Any plugin that fits into these categories or is otherwise known to cause problems may be added to the list or disabled at any time. These plugins duplicate our existing backup and restore functionality. We have seen these plugins cause problems for customers because they use too many resources creating archive files (tar/gzip/zip) and we have seen some poorly configured plugins create recursive backups and sites exceed their allotted storage amount. Recommended AlternativesWe backup your files and database daily for 30 days. You can contact our team to restore your site to a previous version easily. These plugins duplicate our existing caching functionality. We handle caching before your visitors ever hit WordPress, so these plugins will not work properly. Recommended AlternativesNone! We cache your site for you. If you need help making your site even faster, try these suggestions. Use the P3 Profiler plugin to check if your plugins are slowing down your site. Contact our support team. If your site is still slow, we want to know why and how we can help. These plugins don’t add any value and may not work correctly on our system. Some of these are competitors’ integration plugins, and some are superfluous but known to slow down site performance. These plugins hit the database frequently for stats purposes. They are useful, but they negatively impact your sites’ performance. In some cases, they prevent us from properly caching your site. Recommended AlternativesYou can use any service that records and stores your stats off-site. These include Chartbeat (paid), Google Analytics (free), Jetpack (free), MixPanel (free), and Segment.io (free). These plugins duplicate functionality in various parts of our system. 6scan-protection — We take care of security and patching core files. wordpress-gzip-compression — Output compression is handled automatically. Recommended AlternativesYou can use any service that handles the relationship logic off-site like outbrain or Jetpack. These plugins have associated security issues. broken-link-checker — This can cause large amounts of traffic and resource usage. Please try using client software on your computer or an external service. google-sitemap-generator (versions < 4.0) — This can cause performance issues on large sites. Please try Google Sitemap plugin or WordPress SEO instead. google-xml-sitemaps-with-multisite-support — This can cause performance issues on large sites. Please try Google Sitemap plugin or WordPress SEO instead. adsense-click-fraud-monitoring — This can cause performance issues. There are no recommended alternatives at this time.